Pure Anada Loose Mineral Velvet Matte Blush gives your cheeks a soft sweep of subtle color. Comes packaged in a 3 g sifter jar. I love this line and I bought this blush to wear as eyeshadow and it works really well. Pretty light pink works well for shading and blending. This is my absolute favourite blush, hands-down. It provides plenty of colour, but only a tiny bit is needed on the brush, so it really does last a long time. Pure Anada's formula is safe and eco-friendly, too. 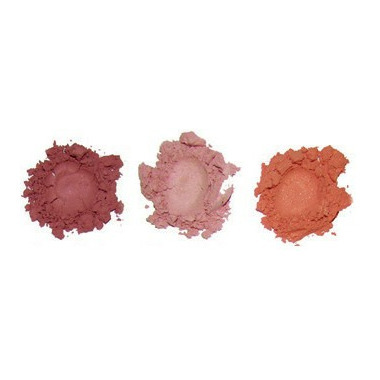 I have this blush in three shades and love them all. I have neutral-toned, fair skin, with dark brown hair and eyes, and can wear most shades. "Berry Blush" is my favourite shade from this line, but I also have "Bloom" and "Petal" in their loose powder blush. Really good blush. Very pigmented. It comes in a little jar but it really lasts a long time. You only need a little bit. Great ingredients too! Love the Berry Blush, lasts me a long long time as I only need to apply a small amount. I am a big fan of the loose powder, and it's so nice to have access to an organic product for my skin! Definitely smaller size than I expected for the price. I actually thought it was a sample when I opened it. Also, the color is way too pale to show up on even the palest skin. I hated the foundation from this brand, so I wasn't expecting to love the blush this much. I couldn't resist buying it in Berry Blush, since it's such a pretty autumn colour. It applies very smoothly, and looks absolutely beautiful on. It's very pigmented too, so you only need a little bit. I bought the color bloom. It's a pretty light pink color. Great for fair skin girls wanting a touch of color on cheeks for a natural look. Great Canadian made healthy and clean makeup product! Manitoba entrepreneur success story as well. Support clean, organic and Canadian made products! Smaller jar than I expected, messy application because you can't really blend product into your blush brush without it spilling everywhere. Really nice colour and blends well. Would be ideal for travel/gym bag or if you have a smaller size brush.